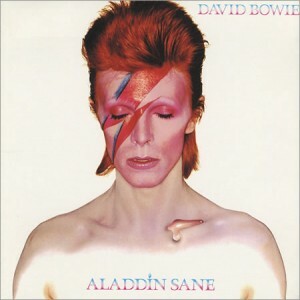 Now is probably as good of a time as any to point out that I’m not as big of a fan of David Bowie as many of you are. I have a shitton of respect for him, obviously, and he’s as important of an artist as any who made their bones in the 1970s. Probably more important than most, as he clearly was a pioneer in glam-rock, funk-rock and electronic rock. But he’s really only slayed me on individual songs, as opposed to full albums. Fueled by a loose-limbed Bo Diddley beat and lyrics that might have been influenced by Iggy Pop, “Panic in Detroit” is also a showcase for Mick Ronson, who overdubs himself not just a bunch of great riffs, but one searing lead after another, and at the end just goes into freak-out mode. With Linda Lewis wailing the Bo Diddley beat as part of her background vocals, Ronson all over the place, and Ansley Dunbar & Woody Woodmansey kicking up a percussion dustcloud, “Panic in Detroit” exudes a sense of menace even before you pick up the lyrics about Che Guevara and smashing slot machines. So when Ronson goes into that aforementioned freak-out mode, it feels like the only natural way for the song to end.